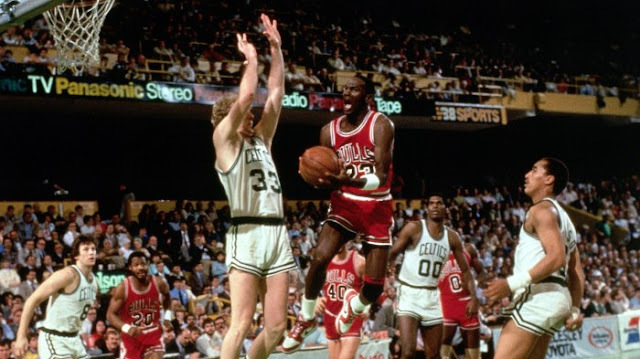 It's Larry Bird's birthday today, and a great time to look at the guy that NBA.com rated the second-best clutch player of all time. No one broke more opponents' hearts than Larry, save Michael Jordan - and even Michael-better-than-Bird is not in stone. Bird may be the very best. NBA.com had Reggie Miller at #5, Magic Johnson 4th, Kobe Bryant at #3, Larry 2nd and Michael first. And Larry definitely was a trash-talker. 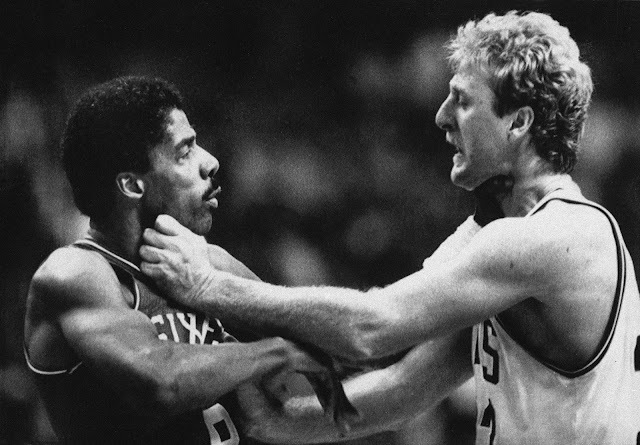 There were whispers that his verbal jabs ignited the infamous Bird/Dr J/Charles Barkley fracas at the old Boston Garden, with me and my friend, Milton Cram in attendance. When the fight subsided, Milt said this was one incident that people would recall for a long time. Chase: Bird had been in a bar fight near Faneuil Hall during the playoffs and was taping up his shooting hand in a fashion that (Sports writer, Dan) Shaughnessy found to be ridiculous. (Bird) started his hustle, saying he could make more shots with his hand fully wrapped than (Dan) Shaughnessy could make normally. Bird’s hand was taped “like a boxing glove” and the shooting contest began at $5 a shot. Sports writer, Dan Shaughnessy: He was just shoving the ball off that hand like a shot put. And he made 6 out of 10, first round. I made 6 out of 10, so we’re even. And then the second round, I was rebounding for him and he said ‘Oh, I’ve got this figured out.’ And he did. He made an adjustment, and he knew. And he made like 8 or 9 out of 10. And of course I step up and I’m starting to see $5 bills fly through the air every time I let go, and I was choking, and he beat me by $160. I think it was 88-62 or whatever it was, but I owed him $160. So I went to the ATM, got him his eight 20s […] He totally took the money, stuck it in his sneaker. And, gross, he played with my eight $20 bills in his shoe the whole night and lit up the 76ers. 3× NBA Most Valuable Player. 3× NBA 3-Point Shootout Champion. National College Player, Rookie, Coach, & Executive Of The Year. Happy 62nd birthday to Larry Bird! I think Bird's foul-shooting victory over Shaughnessy was another clutch performance. I am following this article up with an answer to any reader's questions about the stalking victim label on Bird, found in the title. Any present participant in my CelticsLife Race-to-the-Title contest can pick up a few more points by reading my next article, to be posted shortly after this one. Be the first to give me the name of the player in the bottom photo with my daughter, Lisa, and you pick up three points. Newcomers welcome. Be the first to give me the name of a 6th Celtics player in the Scotch and Sirloin commercial video (it is blurry), and you get two points. Five are easy. You have to give me all six names. Just watching the commercial is worth it.